This is just so wonderful that words don't even begin to touch this. More on "Light a Candle" performed live and lyrics. But -- as B.S.M. comments below -- the text that comes along with the album tracks on Amazon states: "The DVD in this CD+DVD package features three live, never-before-seen concert videos, and videos for four songs on the album." So either the Amazon DVD info is wrong or the DVD will have more than is currently known. OUch, what a wonderful song. Makes me think about Eyes on the prize. Great, great sonG. But it's far away from the other songs on FITR (except Singing a song and Off The road), and it blows away the other songs... Marvelous song, anyway. I love this beautiful song and the video is great too. Thanks Neil! Wow, that's even better than I remembered from last fall's tour. Just stunning. The headstock on that guitar looks like a Martin backpacker. alright, that's more like it. makes me sing "coupe de ville" though...funny! another car song from another era. Can you imagine if a gospel choir got a hold of that song? please mother nature, don't encourage neil's use of choirs. Just an observation..but... Is Neil lookin more and more like the 'other" Neil as he gets older..
GOOD LORDY! and Crunchy Granola! Love this video! Can't wait for the CD/DVD! Every time I see another video snippet of FITR it just sounds better and better. 2 weeks to go to see if the whole matches the promise. And a moments awed silence for the talents of Ben Keith - that slide guitar is just perfect. I'd say I'm a big fan of Neil Young, however, I must admit I prefer his older stuff to the stuff he's putting out these days. I've never been to see him play live so I'm thinking about going to the show in Aberdeen (UK) in June. Any idea what sort of songs he'll likely be playing? I don't fancy forking out £50+ for his newer stuff!!! He'll be playing whatever he wants to and it will be worth far more than £50. I think of Neil as sort of a distant artistic brother. And like a brother, I don't agree with him on everything. I've certainly disagreed with him about things over Lionel trains. BUT I admire the guy too. I haven't gotten all bent out of shape by FITR and to whether Neil can't write anymore or can. But this song is a nice one for sure. And I like it that Neil's involving Pegi more on his recordings. The "Heart of Gold" movie more than proved she can add a nice touch to his songs. BTW, the new song is now on Neil's web site too. gee...the new stuff keeps eveolving for me..thats a great piece of writing elsewhere on greendale..that album keeps shifting and changing for me..im not sure its a great record,but its greatness keeps unveiling itself..and its one reason why i love neil..the more i go back and listen and rehear his records the more i appreciate them....as for fitr, i didnt think a lot at first.and from peter m and glenns bashing i thought this stuff would be awful..however i love the fork i t r video and clip..and light a candle is hauntingly beautiful..and now i find myself singing johnny magic this mornin..just singin a song sounds fabulous..and get around?is even better..
Come on guys, it's a nice touching tune all right, but not much more. A bit too heavy on the hope/Obama message, too, I might add. Video's great though - again. 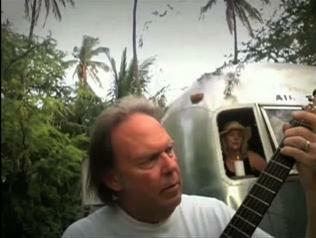 FITR might turn out to be Neil Youngs first piece of consistently good, and funny, video-work. Images get the better of music, eh? Pretty amazing how age changes people's ideals,perspectives and attitudes. Although Neil wrote lyrics of hope and love back in the late sixties and early seventies, surviving the hippy days of "drugs and debauchery"(TIC),his new muse of songs and ideals have never been as strong or poignant as they are today. So, here we are with his new song of typical, beautiful 70's Neil lyrics..
"Light a Candle"...probably would've been "Light a bong" back then hey! Yeah, the doctor is right. Light a Candle is really a good song, in the Slowpoke/Looking forward atsmosphere. Give us a break! Just goes to show how low Neil's stocks have fallen, that a mediocre at best song like this gets that kind of a reaction. You started the ball rolling with that ridiculous first comment too Thrasher - I'm guessing the rest thought they better get on board if you thought so highly of it. Ridiculous. Simply ridiculous. you give us a break, dude. Michael - "He'll be playing whatever he wants to and it will be worth far more than £50." Yeah, cheers mate, that's really helpful. "So all you critics sit alone..."
Hmm, yeah. Everyone's entitled to their own opinion, however, I don't think it's right for all the whiners to tell people who do like the song that they actually dont like the song. Like your opinion is suddenly more valid than anyone elses. If you dont like the song, sure, say so. Just dont call anyone who does like it "ridiculous". And Graeme, I can honestly say, go see Neil, you know you'll regret it if you don't! Recent setlists can be seen at www.sugarmtn.org and check nearer the time, because I think the setlists will differ from the last leg of the tour. They did in Europe last year anyway. And I promise you, it's worth £50. £50 is a bargain. I saw Neil twice last year and no other artist could ever top the show he put on. C'mon!.. Where's "Mother" when you want her?I feel a comment comin' on! For those of you, like myself, who have been listening to Neil's work for a long time now, can rest assured... he's making it happen. The guy has been working like a crazy man lately. Just take a look at his schedule from 2000 to now. Incredible! Like a naked rider, he still feels the pull. 'On Canada'....OOOH, I luv it when ya talk dirty! I love this video! And it's cool that we keep talking about a "video" if somebody makes a nice little movie. Anyway Neil made a good one and the song and specially his slow singing and timing are much better then the live performances. Okay, I have to be honest, the "video" is also much better then my December 8 video. When the FITR video showed up I was expecting that the CD/DVD version of the new album could have a video for each and every song. So, I am surprised about the Amazon news that there are only 4 video's on the DVD. Not even the Johnny Magic clips? No Carl on the new DVD? Come on. But in the text that comes along with the album tracks on Amazon they write "The DVD in this CD+DVD package features three live, never-before-seen concert videos, and videos for four songs on the album." Maybe there still is a change we all get a lot of new "video clips". B.S.M. It's not the fact that they 'like' the song. It's the over the top adjectives that are being piled on it. You'd think by Thrasher's opening description and the comments that have followed that this song is right up there with the best songs Neil has ever done. There's no way it is. It's the best of the recent bunch, but that's no criteria for greatness. This song "simply great" or "marvelous" compared to something like uhh "People on the street" or "Pressure". I'm kidding, I think this is a good song dude. It sounds good anyway. 'Good' isn't over the top. No problem with that description. That's more like it! "People on the street need a place to go, lookin for a place, a place to go". Ah ah ah, it was fun, back in 1986. "The DVD in this CD+DVD package features three live, never-before-seen concert videos, and videos for four songs on the album." The other live songs may be See Change and Get Around? "Deluxe Edition includes both the Fork In The Road CD and a special bonus DVD. The DVD features three live, never-before-seen concert videos, and videos for four songs on the album." It turns out this will be the most likely option since it pops up on several sites and press releases. Johnny Magic is also mentioned as one of the videos. Plus: There is also an EXCLUSIVE Neil Young Tube Amp Repair T-Shirt available as well. Some british review of Fork in the road. "Neil Young is in dog-like, grunge, anti-consumerist, apocalyptic, preach mode, with lardy backbeat and durrr-brain chord changes nurdled through amps cranked to 11." That's the best thing I've heard in years! Is that the trailer he live's in at the edge of town? Wondering. What a beautiful song. For me, it has a special meaning connected to how I view history and cultural change in my mind, and how I view Neil's work: as a fine candle glowing in the darkness. I believe that the electronic media and the smothering availability of information about an otherwise reluctant media participant has overwhelmed those of us who used to hunger after anything we could find out about the man but was limited to album liner notes thus relegating his personal life to be as mysterious as the lyrics to the music itself.now it seems with all of this information made available, the mystique has evaporated to reveal a human being not much different from ourselves.The pedestal has begun to colapse under the weight of over-exposure even to those of us who thought we could never get enough information or art from who we thought was the music worlds "best kept secret".was not it the man himelf who once said "when you talk about mystique, you have none"? The negative reaction to "F.I.T.R." isnt any different than the dissapointment most of us felt upon the release of "T.F.A." after being blown away by Harvest.Only difference was back then we suffered such dissapointments alone.Now we have wonderful forums such as this site (thank you, thrasher! )to vent our feelings to like minded fans of an artistwhom, in our eye's, is still underated.Now, it seems, we are being bombarded with product and information that only time will tell where it all fits in the big picture of a carear that has , even with all the up's and down's, has been an amazing adventure that would have been pretty empty had ai never discovered the man.Believe me, on those "down time's", I searched for another artist that I could latch onto with the same passion as neil, but I've always returned to my first love. I know most of you can relate! Davie from Scotland, thanks very much for your comment and the link to the setlists, I appreciate it!